You are here: Home / Live Pain Free / Is a Pinched Nerve Causing the Numbness and Tingling in Your Hands? Is a Pinched Nerve Causing the Numbness and Tingling in Your Hands? Is the numbness and tingling in your hands waking you up at night? Can’t lie on your favourite side anymore? Not only is your sleep suffering, but you are distracted at work. After using your mouse for awhile, your arm and hands go numb and you have to stand and shake them out. It’s driving you crazy. Could it be a pinched nerve or a muscle knot that is causing it? Numbness and tingling in the arms and hands is a very common complaint I receive from my patients. The two most common causes I have observed is either a pinched nerve (in the neck, shoulder, chest, forearm, and/or wrist) or a “knot” in a shoulder or forearm muscle. The nerves in your arm and hand originate in the brain and travel down your spinal cord. They exit your spine in the neck and weave in and out of muscles to make their way down to your finger tips. Any misaligned bone (spinal, shoulder or elbow bone) or soft tissue structure like a muscle can compress or pinch your nerve and cause numbness. Once you find out where the nerve is being pinched you can get the proper therapy to take the pressure off the nerve. Chiropractors are specialists in diagnosing pinched nerves, so I recommend you find one you’re comfortable working with so you can get the help you need. In the meantime, here are some things you can do to help determine if the numbness and tingling in your hands is caused by a pinched nerve. You tilt your head to the side as far as you can go (ear to your shoulder) and it causes the numbness/tingling. You get someone to press straight down on top of your head and hold gently and it causes the numbness/tingling. Any movement of your head like looking up at the ceiling, tilting your head, or shoulder checking causes numbness/tingling. You bring your affected arm above you or straight behind you (like if you were to stretch your chest muscle) and you get numbness/tingling. Muscles that get overused tighten up and get knots. 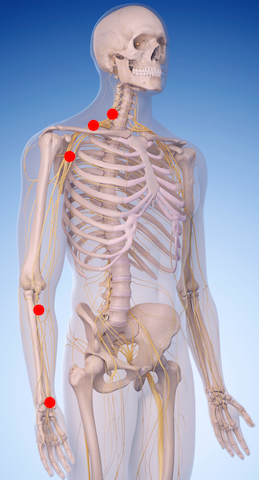 These knots (trigger points) can cause numbness or tingling. This is very common in today’s world as many people are sitting all day at a a desk using a computer. The constant typing and mousing lead to strain injuries in the forearm and wrist. The prolonged sitting leads to postural strain of the back and neck muscles. Knots in the neck, shoulder, chest, and forearms can cause numbness and tingling in the arm and hands. Chiropractors are nerve and muscle specialists. This means they have the skills necessary to determine if your numbness and tinging is coming from a pinched nerve or knots in a muscle. Chiropractors often work with massage therapists and can refer you to them to relax the knots. There are also chiropractors who specialize in muscle techniques like Active Release Technique or other muscle relaxation therapies. If you know where to find the muscle knots and you press and hold them and it causes hand numbness/tingling. Get a thorough examination done by a chiropractor. This would involve tests which would provoke numbness/tingling and even muscle weakness. This helps determine where the nerve is pinched or if there is some muscle knots causing your problem. The examination would likely involve x-rays of your neck to see if your discs (cushions) between your spinal bones are wearing out (degenerative disc disease). X-rays also reveal if there is some arthritis. If there has been a lot of wear and tear building up over decades, your discs can bulge, thin down, joints can wear out, and bone spurs can build up. If this happens, your nerves that come out of your neck and travel down your arm are more apt to get pinched. In almost every case like this, there will be a loss of mobility and misalignments in the spinal bones of your neck. By properly correcting your spinal misalignments (adjustments), chiropractors can help take the pressure off your nerves. Getting the muscle knots relaxed in conjunction with the chiropractic adjustments can further aid in recovery and healing process. What else could your numbness and tingling be caused by? Numbness and tingling in the arms and hands can also be due to other causes: Diabetes, vitamin B12 deficiency, stroke, heart attack, migraines, and tumours all have to be ruled out with a thorough examination and history. Most numbness and tingling in the arms and hands comes from either a pinched nerve in the neck and shoulder area or from specific muscle knots in the neck, shoulder, chest or forearm area. Chiropractic care is a safe and very effective therapy for this type of condition. Again, seek out a chiropractor you are comfortable with and get rid of that annoying numbness and tingling. Live pain free, start sleeping well again, and be more productive at work. Most finger numbness and tingling I see with patients is from “trapped” nerves in the neck. Most cases I see respond very quickly to chiropractic adjustments (spinal manipulation). Most adults notice their symptoms subside within about 6 visits, but this is dependent on a number of factors. As mentioned in the article, a thorough examination should help narrow down the cause of it. I wish I could tell you how long it will take to go away exactly. This is easier to determine with my own patients, because I am applying a specific therapy and can monitor them more closely. Maybe reread the article to see if you get some strategies for yourself. Good luck. 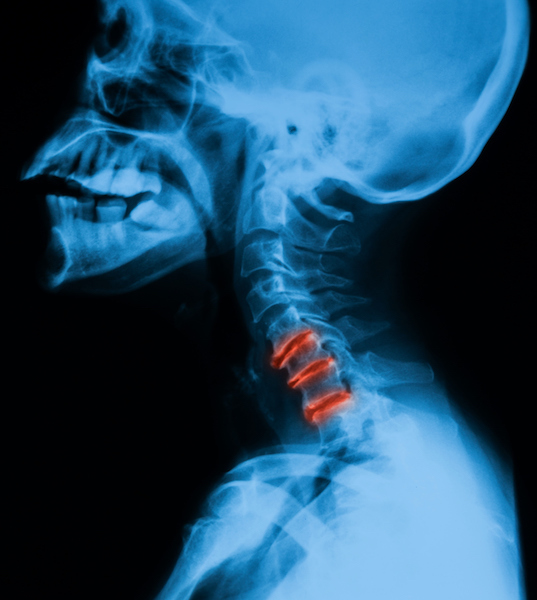 I’m not sure where your nerves were pinched, but I had a similar situation back in 2007 with my C5-C6 vertebrae, which was due to a slipped disc. Worst pain of my life, and I lost some nerves in my right thumb. I’m happy to say that by four months later, a skilled physical therapist had completely alleviated my problem and I’ve been essentially fine ever since. Except, of course, for the dead nerves in the thumb. The good news is that the nerves have slowly regenerated through the years, to the point that I’m now almost back to 100% in my right thumb. The bad news is, it took over a decade for that to happen. Take heart, I’ve learned that physical therapy can do wonders. I say I’ve been “essentially fine” because I’ve had other upper back and neck problems in recent years, and I found this post as I was preparing to contact a doctor about my left arm this time, which seems to be suffering a pinched nerve in my rotator cuff area. Because of previous experience, I’m optimistic about another positive physical therapy outcome. I hope you become healed and that PT works as well for you as it did for me! I have no insurance and cannot afford a chiropractor. However every time I sit in my bed with the pillows propped behind me my left hand goes numb and it hurts. 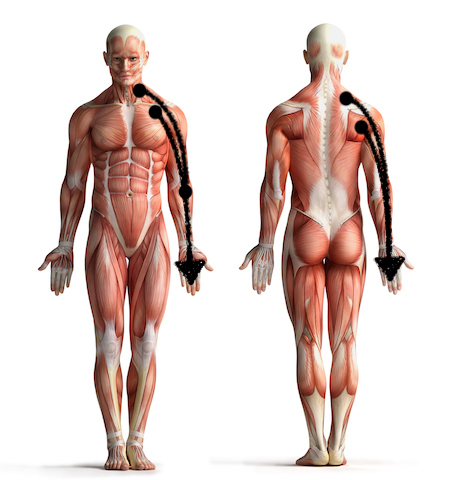 Are there any exercises I can do to try and reverse the pinch nerve or muscle not that I think is in my shoulder and neck area? Generally propping you head up with lots of pillows puts a lot of stress on the neck and nerves that come out of the neck that run down your arm. So you can try to use a lower pillow and see if that helps. If you sit a lot at work, see if your employer would invest in a standing desk for you. Standing is healthier on the back in most cases. Use a foam roller or roll up two terry towels really tight (about 2 feet long), put it on the floor , lie directly on top of it so it runs lengthwise underneath your spine, spread out your straight arms above shoulders height and to the side, take a deep breath in (hold for 10 seconds), breath all of the way out (hold for 10 seconds), repeat the cycle 10 times. This exercise brings back the shoulders, opens the rib cage up, and pushes the spine forward towards the chest. Hope this helps. I’ve been suffering from a pinched nerve in my neck or spin in which I have a muscle knot along my right shoulder blade. I’m on a nerve pill that takes the uncomfortable pain away from my chest and right arm . I still get nerve pain in my chest and arm but not as bad. The knot in my shoulder blade throbs so much at night I have to use ice and lay on a tennis ball and take high amounts of ibuprofen and Tylenol to take the pain away enough so I can fall asleep. I’ve gone to RMT and every time I do the pain gets worse,I do see a chiropractor and i don’t feel a difference. I have an appointment with my doctor so I can see about getting an MRI. Is what I’m telling you seem to be a spinal problem? Thanks for your reply and if you have other questions I will answer them. Thanks for your inquiry. In most cases like this I see, it is a spinal problem. You might want to get another opinion from another chiropractor. I’m not saying your chiropractor is doing a poor job. Sometimes just a different approach and fresh eyes can solve the problem. The other problem I would be ruling out is a problem with the gall bladder and/or liver. Problems in these areas, like an inflamed gall bladder from gall stones can cause pain in the right shoulder blade area. Hope you find some relief. Hi there I had a trap nerve in my neck a year ago I went to the chiropractor 3 times and it helped. A year later I have numbing and tingling in my right thumb and index finger and my wrist aches. Would seeing a chiropractor help this? As my doctor said it is carpal tunnel. Thanks for your inquiry. Chiropractors see a lot of cases like this with neck and arm pain. Invariably a “pinched” nerve is the cause. Getting a through assessment done by a chiropractor would help determine this for sure. So I would book an appointment with your chiropractor first and go from there. I wake up at night with the tingling numbness in my hands, however, the real issue for me is that my nerves keep pulling my head to the right side. I can look in the mirror, straighen my head and watch my head slowly pulling to the right. Do i need an operation or can a chiropractor help me. It sounds to me like your nerves in the neck are “pinched” causing the muscle to get tight which can cause the head to be pulled over or tilt. Without me examining you I can’t say for sure. Chiropractors will see this scenario a lot in their practice and are usually able to help. However, if you got a thorough assessment by a chiropractor he or she would be able to tell you for sure and either treat you or refer you out to someone that can help. If you haven’t yet, I would recommend you have a consultation and examination with a chiropractor. They might be able to help you live more comfortably. Hi there. I have been experiencing severe tingling and numbness in both my hands this week but thepins and needles feeling also shows up all over my body – my face, toes, legs and occasionally even my back. The tingling/pins and needles goes away when I’m in bed, and returns throughout the day. Is there any chance I should see a chiropractor about this or just continue to explore other causes with my doctor? Based on your history, it sounds to me like your pins and needles are posture related (weight-bearing in your case) which likely means the problem is stemming from the spine. Regardless, a thorough examination by a chiropractor would help determine whether he or she can help you with this problem or refer you out to a different specialist. I’m so happy to have found this forum. I’ve been suffering from numbness and tingling down my right arm for awhile. It almost always happens when I’m working at my computer desk and stand up. I can sit and type for hours, but as soon I stand up, my arm gets this weird feeling in it and I can’t move it or it will twitch if I try. I lose sensation in it and get numbness and tingling. I can lie in bed and get up and it doesn’t happen. It usually only happens from a sitting position especially on days when I work at the computer. Any idea what is going on? Numbness and tingling in the arm that occurs when changing postures like you are describing usually indicates the nerve is likely being “pinched” in the neck area. I would recommend you consult a chiropractor so you can get a thorough history and examination done to determine the root cause so you can get the proper treatment for it. Hi Dean, I am at a loss with the spasms I have to endure everyday. I struggle through work and a lot of the time with a headache. I have been to two chiropractors, two doctor’s and a massage therapist. It started when I was about 24 and I am 36 now. It started with just a spasm in my right trap over my shoulder blade that would burn while I worked. I use bandsaw and belt sanders a lot. The docs took seats and did bloodwork but could find no reason why they are happening. My arms fall asleep to the point that I wake up in pain. Almost all of the muscles in my upper shoulders and neck area are always spasmed out. As well as the hip area and into my thigh and calf on the right side. Some days it hits me so hard that I get a horrible migraine and can do nothing but try to sleep the day away and miss work. I am limited on what I can do when I have my son and I really want to be active with him more than just the occasional lucky day I feel ok. I do believe it is pinched nerve and if I know where maybe I can work those areas more? Any advice is greatly appreciated. I am always in pain and I don’t remember what it feels like to feel normal. Thank you so very much! I forgot to mention that they tried forceful and Baclofen and neither helped at all. If the chiropractic care and other body therapies don’t work for you, I would seek out a functional medicine practitioner to dig deeper into your problem. Best of luck to you Chris. Prolonged sitting (desk work) is one of the worst postures you can put yourself in. This sitting posture creates a lot of stress on your spine and nervous system. Tension and immobility can build up in your spine over time and nerves that run through your neck and down the arm can get entrapped. The pins and needles (or numbness with some people) in arms is usually an indication there is a ‘pinched’ nerve in the neck. Getting a thorough consultation and examination with a chiropractor you are comfortable should be able to determine if that’s the case for you. It sounds like it. The adjustments chiropractors do in such a scenario can relieve tension in the spine, restore spinal mobility and alignment, thereby calming the nerves down and improving brain function. I’ll look into that, thank you! In most cases like this, seeking out your chiropractor on a regular basis can help prevent a condition like your husband’s from coming back. Or at least the regular chiropractic care would help manage his condition. Pain medication doesn’t solve the UNDERLYING CAUSE of the problem. For example, is his pain due to a lack of Advil in his body? We don’t even produce Advil in our body, so anything that is not compatible with our physiology tends to be toxic to the body. Sometimes pain medication is necessary, but without being familiar with your husband’s case on a deeper level I can not say for sure. And for sure, physical exercise and movement, in general, helps keep the back and neck strong to help prevent pain syndromes. Hope this helps! Not sure if it’s a pinched nerve or nerve entrapment or a muscular issue. I recently started to get pain in my neck on the left side if I look down or if I bend over and that leads to my thumb and pointer finger on my left hand feeling tingly. Tried heat and it helped relax it a little while it was on. Once it was off, nada. Aleve and ibuprofen help a little. Laying down on one pillow or sitting with one of those travel neck support pillows feels fantastic. This is not a feasible option because I do have a job where I am constantly up and moving around. Not sure what to do at this point. Do I look for a chiropractor, a pain management doctor, an orthopedic doctor? Since your neck pain and arm pain comes on with a change in postures it sounds nerve and mechanical based. This means consulting a chiropractor you can trust would be my first recommendation. From a more detailed history and examination they should be able to determine if they can help you or refer you out. Hello ive just recently had my entire right arm and hand start going numb by itself throughout the day was using a poor office chair that did not have any support was wondering if poor posture could be causing the numbness? Yes, for sure poor posture can be causing the numbness. Here are some articles I wrote that may hale you understand this better and what you can do about it. I hope they help. I have had a tingling in head, left side of my face and left arm and fingers. The arm tingling comes and goes but the tingling in the head has been pretty persistent since Monday. I’ve been to the doctors who said it could be a pinched nerve and to wait 7 days but it’s causing me more worry. I’m in my early 30’s, they said if it continues they can forward me to see someone at the hospital. Without me assessing you or knowing your detailed history it’s hard for me to say what it is. I have had many patient’s with symptoms such as yours where chiropractic care can help immensely. I would seek out a chiropractor you are comfortable with, get a detailed history and examination done, and let the chiropractor determine what the likely cause may be. He or she would be able to determine if they can treat you (with your consent only) or refer you out for other diagnostic tests. Good luck Dee. It sounds like a “pinched” nerve in your neck. Consult a chiropractor you are comfortable with and get a thorough history and examination done to determine if chiropractic care can help you. I recently have been waking up with a numb ring/pinky finger and a sharp pain in my back (rhomboidal area).It disturbs my sleep and makes me feel anxious during the day (as I am a musician and use my hands a lot). Sometimes during the day my palm and fingers feel sensitive, but I find If I move about, the symptoms lessen and my hand feels normal again. I have had this problem for a bout a year now, but at the beginning it was much worse, tingling 24/7 and pain in forearm. I think this problem might be cause due to a trapped nerve in my neck/back, possibly due to the rhomboid muscle being tight. Should this problem eventually go away? How should I get rid of this? These problems will tend to go away faster if you get chiropractic care. I find patients who are confident in the practitioner, trust the process, and are compliant with the chiropractor’s recommendations respond the best. Most patient’s will respond within 6-12 visits of chiropractic treatment over a 4-6 week period. Hope this helps. I’m going to give you similar advice as I have been giving other people. Find a chiropractor you are comfortable with and confident in. Make sure they do a thorough history and examination to determine if they can help you. Trust the process and be compliant with the chiropractor’s recommendations. Most patient’s will respond faster and better this way. Most patients will notice a SUBJECTIVE improvement within 6-12 visits of chiropractic treatment over a 4-6 week period. Hope this helps. Hi,I’ve had for a year now pain in the joint of my left shoulder.almost feels like there is a small ball in there that’s causing a missalighnment. This causes a sensation down my arm and the top of my forearm numb with my first and ring finger numb and tingling.do you have any idea what it could be? It sounds like a pinched nerve in the neck. Without doing a thorough history and examination I can’t tell you what it is with 100% certainty. Please consult a chiropractor you are comfortable with and confident in. If the chiropractor you seek out is confident they can help you and you consent to treatment, be compliant with their recommendations. Most patients will notice SUBJECTIVE improvement within 6-12 visits over a 2-6 week period. So this means some patients notice a change right away after the first one or two visits or it may take a month or two. A couple days ago I felt a strange pain on my chest on my right side like if it was bruise pain when rubbing it tried massage it. But it only hurt more. I stopped touch it i tought I was probably making it worse so I left it alone. The next day my chest pain felt less but I started feeling my right arm lightly numb. Today I got worse more numbing, tingling, a little burning feeling on my right arm. Its not painful but uncomfortable. Could this be a sign of a pinched nerve? Yes it sounds like a pinched nerve. I would recommend you go a get a thorough history and examination done by a chiropractor you are comfortable with to get a proper diagnosis. Hello. I am in desperate need of help. For years I have had a painful knot (hard, small) on my right shoulder blade. It’s extremely sore to the touch but also aches constantly, especially if I use my arms a lot cooking or cleaning. For about 6 months when I sit, & especially when I lie down, my arms/hands/fingers go numb/burn/tingle/ache to the point that it will wake me at night & can be truly unbearable. Does this sound like a muscle knot or a pinched nerve? Can a knot pinch the nerve? I do have an appointment with a Chiropractor but it’s not for about 5 weeks. Yes, it sounds like a pinched nerve. How come you have left it for so long? Can’t you see a chiropractor right away rather than waiting 5 weeks? You correct it by going to a chiropractor you trust. They can give your regular adjustments to help improve your posture and increase your mobility and strength via the nervous system. They can also recommend specific exercises for you based on your case and examination. And they should be serving you by encouraging you to make other necessary lifestyle changes that will help your body function better. My left finger, then hand , then entire arm up to shoulder and part of my upper side gradually began tingling and became relatively numb over the past few days. We’re going on day 4. It’s not really painful. I sleep on my arm almost every night. Could it be a simple pinched nerve from that that will resolve itself? It could be a pinched nerve, but you should go get it assessed by a chiropractor you are comfortable with. Listen to your body. Even though your body has the innate ability to heal itself, symptoms mean something is wrong and you shouldn’t ignore it. It may go away by itself, but many times your body can heal with layers of accumulated damage that build up over time. At some point, the symptom can come back and often worse and more frequent. The earlier you correct a problem in your body the better your body can function and heal. About two years ago now I was playing with the dog on the kitchen floor and my thumb came straight down into the ceramic tile ,when it happened my thumb tingled and went numb. This went on for about a year ,now the top of my hand near my thumb has a burning pain that is very annoying often shooting pain half way to my elbow. Chiropractors are trained to diagnose and treat extremity problems as well. A thorough history and examination can determine if the chiropractor you choose could help you. The examination should include looking at your spine shoulder, elbow, wrist, and thumb. I have the nerve pain in my right shoulder, never ends. Will be looking for a Dr. Mine retired 2016, I had seen him for 20 years. No new, or especially young doctor has appealed to me at all. Again, the nerve pain iis n my right shoulder. Is that at all common? I am post menopausal and 51 yrs. old. Sleep is extremely elusive with both pain and night sweats!!! Pain in right shoulder and tingling in left hand. Yes, it can be common. I was once told early in my career by a mentor that “chasing pain is like chasing a rainbow”. What he was saying is that as a practitioner you can’t always treat where the pain is anyway. You have treat the “underlying cause” of the pain which can be in another place all together. Good luck in your search to find a replacement. About a week or two ago I woke up with a pain on the right side of my neck. It only hurted when I turned/tilted my neck to the right side, and had been slowly going away. My right thumb had been slowly becoming numb, but I just passed it off as me holding a pencil too hard as I had an exam the day before it became numb, and my fingers have become numb for a few days after I held a pencil too hard in the past. Fast forward to two nights ago and my thumb had been getting more and more numb, but the pain in my neck had gone away. While in bed, I turned my neck to the right side and hit this extremely painful spot and felt my thumb tingle. As of today my thumb is still numb and shows no sign of getting better, and that spot on the right side of my neck had renewed its pain. This is kind of worrying to me as I’ve never had this happen before and I’m only 18 years old. What is your take on this? Although a thorough examination by a chiropractor would be able to give you an accurate diagnosis, I would have to say by your description that it is likely a pinched nerve in your neck even though the pain in the neck is gone. Your body has the ability to heal itself (like when you get a cut, broken bone, or even a virus) which is likely why you neck pain is better. In a lot of cases the numbness will go away to especially with your age. However, your body displays these symptoms because it’s telling you something is wrong and you should get it checked. I have found after many years of practice when people ignore symptoms like this for a long time, they tend to end up with very stiff spines with accumulated wear and tear. Conditions such as osteoarthritis and degenerative disc disease can develop more rapidly. At that point, when they are in their 40s or older their problem becomes more of a challenge to deal with. So I would make an appointment with your chiropractor as soon as possible if you have one to get a diagnosis and treated (adjusted) if indicated. My 16 y.o. daughter is a right-handed softball pitcher. She was diagnosed with biceps tendinitis several months ago due to overuse from overhand throwing, which eventually manifested into pain/complications with her underhanded pitching also. We had shoulder MR arthrogram done which showed no physical abnormalities or damage in the shoulder capsule/region, so we did fairly intensive physical therapy to overcome the injury. PT went well after 2 months and the pain and clicking of the shoulder region ceased when going back to practice the overhand and underhand throwing motion, but now she has TOS for some reason, which never existed previously. On her right side, when she throws overhand, her hand goes temporarily numb (mainly ulnar nerve side of hand) after about 10 overhand throws or 70 underhand pitches. After approximately 15 minutes the numbness retreats completely. EMG shows normal right upper extremity nerve function, and x-rays and MRI show no anatomical defect in the brachial plexus region of the neck and shoulder. What is interesting is that if she tilts her head to the left, she will start getting numbness in the fingers, but if she uses her left hand to hold the tilt of her head to the left and simultaneously uses her neck muscles to pull against the leftward pressure, the numbness ceases. Sounds like the scalene muscles being activated to attempt pull back to the right is reducing the TOS issue. Is this a scalene muscle “weakness” issue? Activating the scalenes, you would think would further decrease space in the thoracic outlet and increase the symptoms, rather than improving them like we are seeing. It seems a little perplexing. Her chiropractor was the one who determined that the scalene activation resisting tilting to the left improved the symptoms, whereas the PT and orthopedist had not tried that particular clinical test. Any advice on where to go next in this case? Thanks for your inquiry. Most people, especially younger people like your daughter, respond very quickly to chiropractic adjustments for cases like this. Without me examining her I obviously can’t say for sure what is going on. I just know in most cases I see where numbness down the upper arm is involved, especially with neck movement, there is going to be an alignment or mobility issue in one of the neck bones that needs to be moved correctly (adjusted) to re-establish proper brain input and output. Most patients will respond within 6-12 treatments from my experience. I believe I have a pinched nerve in my neck. When I do the suggested exercises my left arm and hands gets pins and needles. Should I proceed with the exercise anyway? Sorry for the tardy reply. Exercises or movements that cause pins and needles should be avoided. I’ve had numbness in my left neck/shoulder for over 5-7 years now, when I lift my left arm over my head, I start to get tingling/numbness in my left arm and then in my middle/ring/little finger. I also cannot feel anything on the impacted area on my left neck/shoulder, even if I pinch or pressure the area. I’ve done a CT scan and saw a neurosurgeon in the past and the results came back all good. I’m not sure what else I can do? A CT scan or even an MRI is “snapshot” at a specific time. Those types of imaging are great for determining “obvious” structural problems in the spine or brain that might be impinging (pinching) the nerves. However, most numbness and tingling I see in the upper extremity like you have is fixed readily by chiropractic adjustments. Yes, you need to have it assessed thoroughly before you partake in that treatment, but in my 24 years of experience chiropractic care works very well for the type of signs and symptoms you are describing. When the numbness and tingling are worsened with arm or neck position, and you have been cleared of serious issues in the spine, that tells me their is a “functional” problem in the spine (spinal misalignment or lack of mobility in the vertebrae in the spine) that is causing it. Sometimes the muscles in the neck or chest area can “pinch” the nerves as well. I’m 65, experience Raynauds symptoms with a temp drop. I think, however, that my current week long pins and needles in my hands is caused by nerve compression in the neck and shoulders, but my question is can lip tingling be caused by that compression? 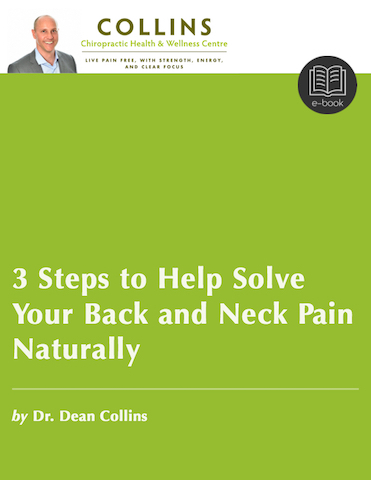 Yes, mobility and misalignment problems in the neck may cause facial tingling.